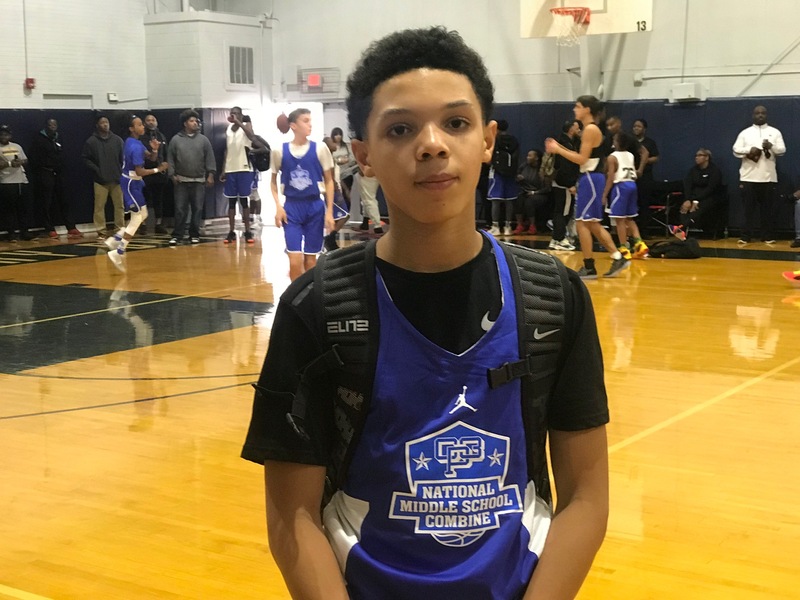 Winston-Salem, NC – Although the high school season will be starting soon, we turned our attention to Middle School standouts. That means ROAD TRIP!! 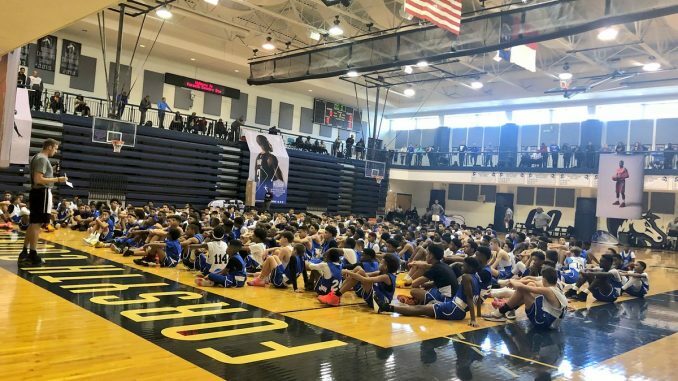 We headed down to Winston-Salem, NC to evaluate the prestigous CP3 National Middle School Combine, where we witnessed some of the “who’s next up athletes” in one setting. The State of Florida and North Carolina stood out this year but other States definitely represented. 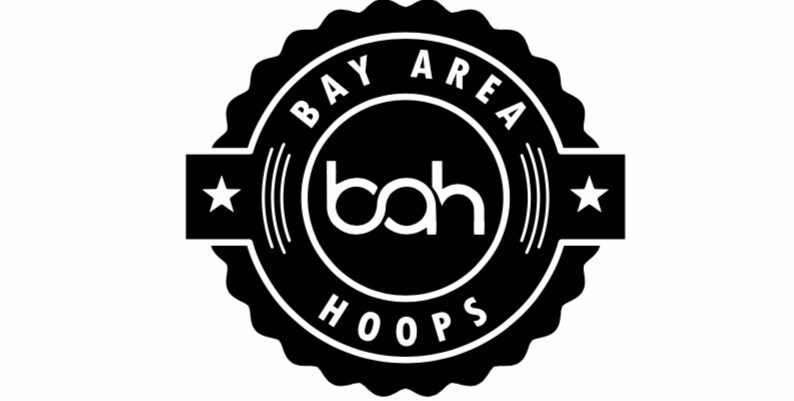 There were several extordinary players, many of them will be watched throughout their transition growth in the culture of high level basket ball. As they develop they’ll discover various opportunities to use basketball as a vessel to improve their lives in upcoming years. At this point, Scouts, Coaches and people of the industry will be watching these players as they ring on a national stage. 2023 6’7” Forwards Mathew Bewley & Ryan Bewley of Florida United(FL) took part in last weekends CP3NMSC along with other top prospects from around the country. Even amongst the nation’s best the Bewley twins were powerful, dominant and made a presence. Their already physically mature then most of there peers so they’ll need to keep adding to there game as the gap physically start to close in the future, but right now they stood out like sore thumbs in NC. What makes them unique, is that there still raw in skill but have an “Run and Gun” type game. The twins also thrive when its time to spread the floor and attack from the perimeter in man defenses and that was immediately apparent. Ryan combines shooting with good athleticism around the rim and Mathew combines power and athleticism at the basket. Here’s a look at the rest of the names to know. Let’s start off with 2023 6’7” F Jayden Hastings of Pine Castle Christian (FL) – Hastings is not trying to be anything other than a big man, but has the tools to be a modern-day big man something similar to ex-University of Texas standout Mo Bamba. He’s One of the few players I thought was still raw but maximizes on his strengths when he uses them to alter shots and grab rebound. As he matures physically and build up his frame he’ll continue to be an affective piece on the floor. Hastings is athletic with raw skills but he’s long and athletic plus he has clear tools for a long-term upside. The 6’3” F Cameron Scott of Pleasent Hill (SC) has a long wingspan with tons of upside. Scott will be an interesting player because of his attributes, be sure to watch this young man because he can be something good! He’s an intriguing prospect who is linky, and has a frame that looks like it might not be done filling out; he’s also a basket of raw tools that will develop in the future. He goes hard to the glass and fits the prototype of a Marcus Camby (Ex NBA player for the NY Knicks). Scott has good mobility and a soft touch. 2023 6’5” Dennis Parker, Manchester MS (VA) has capabilities to be versatile in the front court. 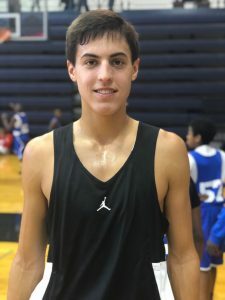 His size and skill made him an easy find, even at the middle school level but what is perhaps most encouraging about his long-term prospect is that, Parker is a worker and has already made notable upsides in his game. Not to be unnoticed, 2023 6’6” F Gus Yalden, Xavier (WI) AKA “Mr. Post Work” he was fundamentally sound in the paint. He knows his roles, he keeps ball high and he will scrap! Yalden not only impressed us with his strength and physicality but also his ability move, put the ball on the floor and do the little things. He showed a very capable shot as well as being able to finish through contact. 2023 G 6’4” PG Ryan Davidson, North Laurel(KY) displayed size, athleticism, a knack to find the open man and showed us that he can make good decisions. He’s a player you want to know because of his size and explosiveness; Davidson’s upside is embedded in his physical tools that are immediately noticeable however he plays at a controlled pace that allows him to operate effectively. With continued work on his outside shooting, he can expand on his scoring. This is our second year of watching 2023 PG Aiden Holloway, J.M. Alexander(NC) and he steps up every time when the competition does! Halloway goes off the dribble, he can kill you from outside or blow by you. Holloway is a budding big point guard with an offensive skill switch and good feel for the game. He also has lots of maturity for his age, especially in his approach and offensive skill. 2023 6’2” G David Delancy, Franklin(FL) plays the right way and doesn’t seem to get caught up in distractions or individual accolades that can hurt young players today. He’s been a well-known prospect before he even reached the 8th grade and for good reason. His vision, good size and playmaking ability makes Delancy dominant already however, he needs to keep developing vocally because he’s capabilities to play both guard spots will help. His consistency to create off the dribble and shooting from the perimeter will keep expanding while his game will continue set itself apart from his peers. 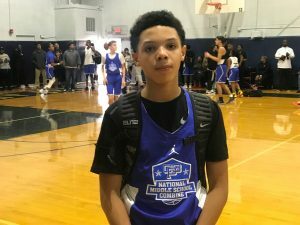 2024 G Jayden Reid, Holy Family(NY) made play after play and he proved to be an advanced shot-maker and scorer for his age. He too physically is a late bloomer, so he is maximizing his quickness and hope to see him to continue developing his playmaking skills. Reid can be a walking bucket who can play both ends when he wants too. One of the two flashiest guards was 2023 PG Elijah Green of Jay M. Robinson(NC) who kept your attention! A Smooth guard with vision, skill and Impact tendencies plus highly skilled and crafty for a guard. Green plays the game with high veteran savvy. He shoots the ball with range, has a high IQ, and pin point ability to work his handle in a way most PG take years to learn. 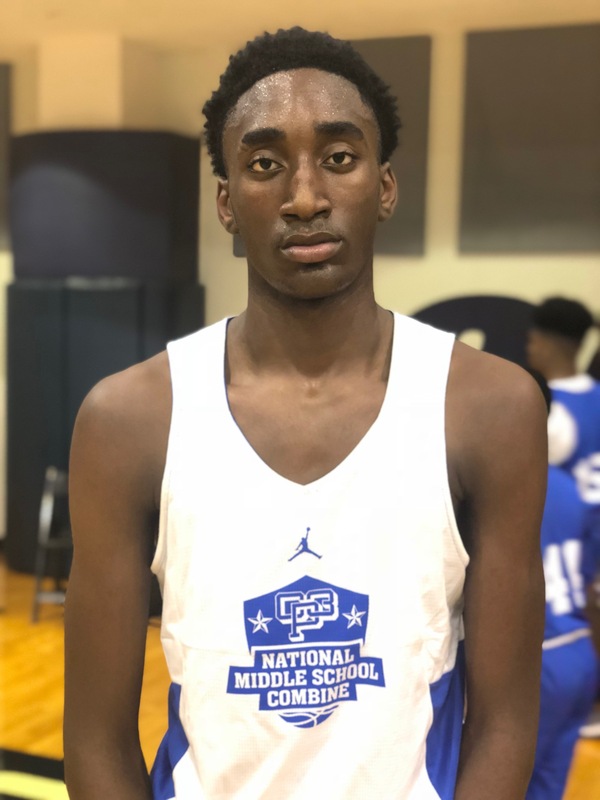 2023 6’2” Keyon Lewis of Midland, TX as so much room for growth. Plays both ends, can create off the dribble or make someone else better. A strong guard who should grow into a wing position and who can punish other teams on mismatches. Lewis has decent ball handling skills that allow him to go by smaller guards and is comfortable shooting over bigger forwards. His athleticism makes him a great rebounder and finisher. Maybe the most impressive and our second flashy PG was 2024 PG Jaylen Washington of Frisco Hunt (TX). When I say he had the ball on a string it looked like the ball was part of his hand! Washington is a young point guard that displayed a variety of capabilities which wasn’t just ball handling but included a lethal jump shot and a unselfish mannerism. He commanded attention because he played the game beyond his years. He keeps a calm demeanor and never got rattled. With growth, Washington will be a player you will remember. 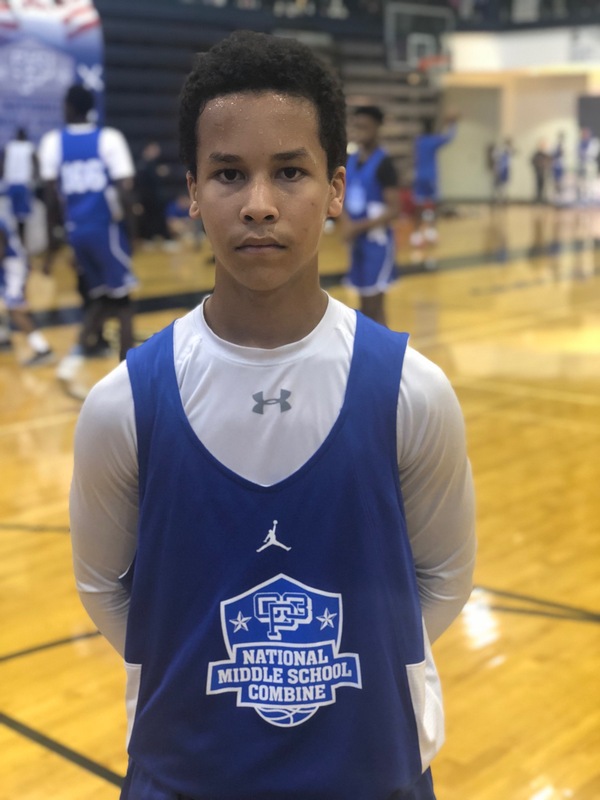 2023 PG Curtis Givens, Memphis University (TN) – is a patient plus highly intelligent PG with capabilities to add range to his shooting. Givens can stretches the floor well beyond the arc coming off the dribble or has a spot up performer. He plays a systematic game with and The image of the new age shooting guards who finish behind the arc. 2023 G Malik Olafioye, Lincoln Park(MI) is amazing. Olafioya made plays on both ends, showed his true competitiveness and displayed a decent skill set. With added shooting and growth, he can become a sought out player. You always ind a player who makes things happen and that was 2023 PG Joel Harrison of Benito MS (FL). Harrison moved in out of traffic gracefully, played unselfish ball and controlled the tempo at all times. Concentration on shooting will be a must has he continues to grow but a bright future is ahead soon so be prepared to hear his name. 2024 PG Jeremiah Gorham of Parkside MS (VA) was a staple of a consistent lead guard. He’s a solid PG with a ton of upside. Gorham patience and skill enhanced his game to be very efficient while showing that he also can lead others. New faces from the State of Florida came out to NC and performed. Players like 2023 G Jordan Lanier of Franklin Academy (FL) gave his team an edge with his energy plays. Lanier is a poster child for heart and hustle and his size didn’t matter. Lanier made use of his speed to test defenders and left everything on the floor. 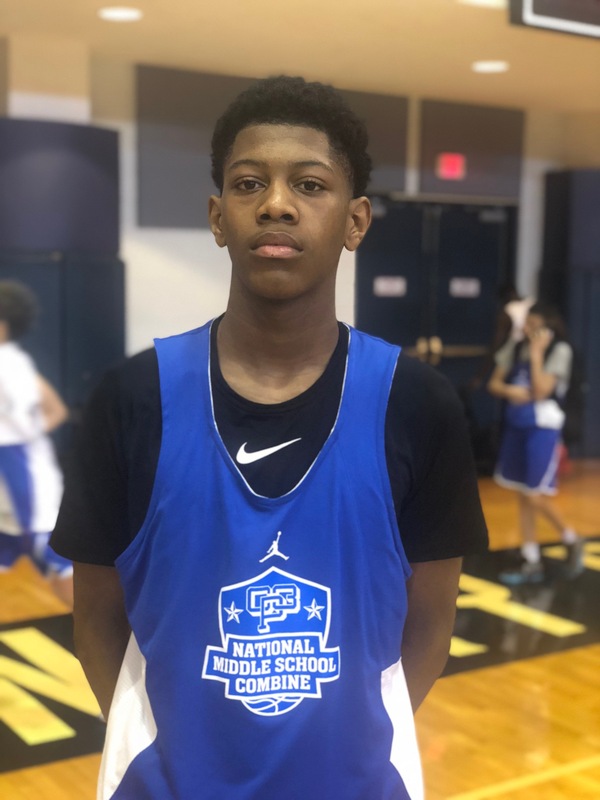 2023 6’2” G Karmello Branch, Turner-Bartels (FL) who came into the camp off a MS championship in Tampa showed why he was capable of leading a team. Branch is linky and energetic. He made a good first impression at CP3 NMSC by running the lanes in transition & his knowledge of the game. 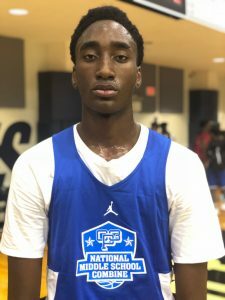 Branch who has grown a few inches since our last viewing, is starting to make is way around the National scene and we hope he continues to work on is strength because he can be special. A similar player was 2023 Parrish Johnson out of Georgia who is another slim athletic player with good qualities. Johnson’s active play was hard for most to defend because he moved in transition and took quick shoots in half court sets. He has the tools, so has he advances in grades only time will determine is outcome. 2023 6’2” G Tyler Balley of Southeast Gullford (NC) made Elijah greenthings look easy at times. Great use of either hand and looks for open players. Balley is a definition of a quite killer because he is able to fill up the stat sheet. Watch him!